In large bowl, mix cookie mix, flour, butter and egg with spoon until soft dough forms. Divide dough into 4 pieces. Place pieces of dough into 4 small bowls. Tint 1 bowl blue, 1 bowl pink, 1 bowl purple and 1 bowl yellow by stirring in each food colour. On floured surface, drop tablespoons of each dough in random pattern to make large rectangle. Dough pieces should be just touching together. Push dough rectangle toward centre on all sides to make 7x6-inch rectangle. Roll dough 1/4 inch thick to create marbled pattern. 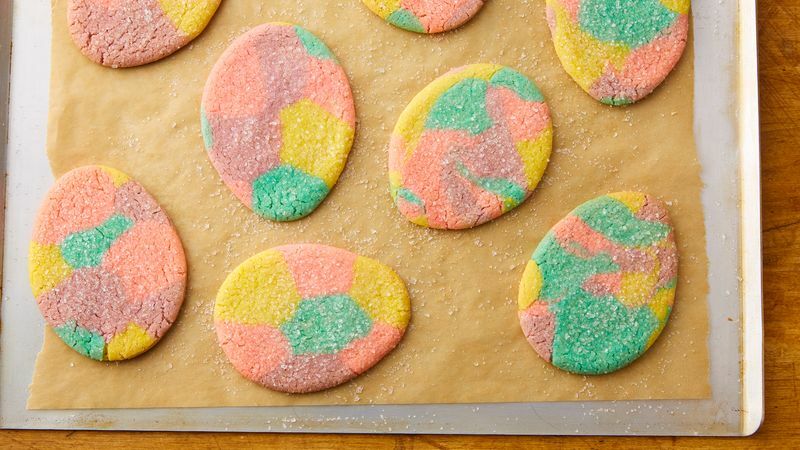 Cut with 3-inch egg-shaped cookie cutter; place cutouts 2 inches apart on ungreased cookie sheets. Sprinkle with sugar. Press any leftover scraps together, and reroll on floured surface to make more cookies. Bake 7 to 9 minutes or until edges are light golden brown. Cool 2 minutes; remove from cookie sheets to cooling rack. Cool completely, about 15 minutes. No sparkling sugar? Try granulated sugar for extra sparkle on holiday cookies. To help get cutout cookies off the surface to the cookie sheet, lightly press back of cookie spatula in flour, and slide under cookie dough for easy lifting. Wearing food-safe plastic gloves makes mixing food colour in the cookie dough easier and will not stain hands! Single-use plastic gloves can be found at most large retailers.